Narcissus 'Cedric Morris' has been in flower since Christmas and here we are in March and the same flowers are still going, pretty good value I would say. 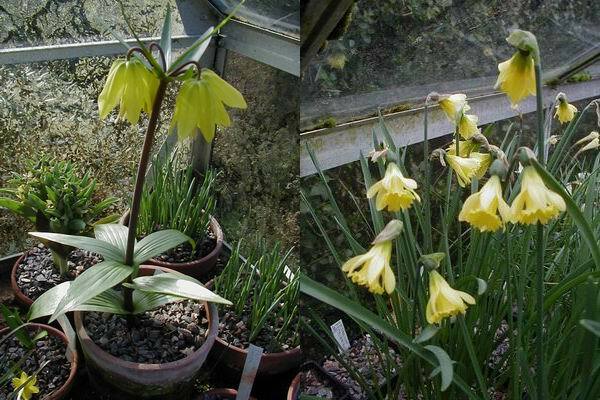 To keep you up to date on the progress of Fritillaria chitralensis it is now in full bloom and it has a lovely scent to match its' beauty, I am waiting for the pollen to start flowing then the paint brush will be out. A wee tip if you are using a paint brush to transfer the pollen and you have trouble getting it to stick to the hairs of the brush just like the back of your hand (it is usually less dirty than the front) then flick the brush across the licked bit and it will pick up just enough moisture to make the pollen stick to the hairs so you can transfer it to the stigma. You can see how quickly things are moving in the Frit house all but a few are through. With all this growth we are constantly keeping an eye on the moisture and regular watering is essential if you want your bulbs to grow and increase for next year. Here you can see the mini hose and tap that I recycled, it is ideal for watering bulbs as I can direct the stream of water exactly where I want it to go. I choose a bright day and give all pots that are in growth a flooding of water this will keep them going for up to a week if it is not too warm. I think it is much better to flood the pots like this than applying a dribble every day. 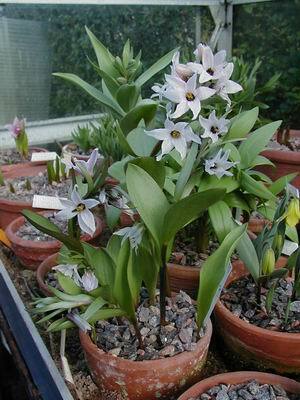 Always the first American frit to flower is pudica, this is a selection that we raised from seed collected in Washington State, it is not as big as F. 'Richard Britten'(which is one of the few not through yet) but it is bigger than the form that has been in cultivation for a long time in the UK. Some of the flowers show quite a lot of red on the shoulder of the flower. Frit stenanthera from Central Asia is a great favourite of mine and it also has a sweet scent not something you can say about many frits! This is a seed raised pot and some have quite a degree of pink while others are nearly white. We used to grow a nice form that had a bluish tint but sadly I managed to loose it. 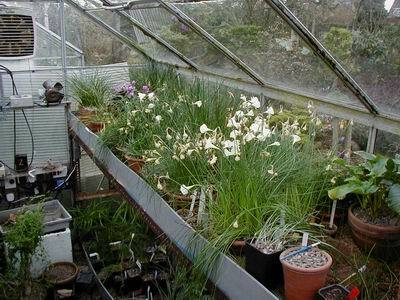 Across in the bulb house the Narcissus romieuxii types are coming to an end of their flowering and now is the time to give them plenty of water and feeding to build good flowering bulbs for next year. They have all had sulphate of potash sprinkled on the pots a month ago and they will also now get some liquid tomato fertiliser. 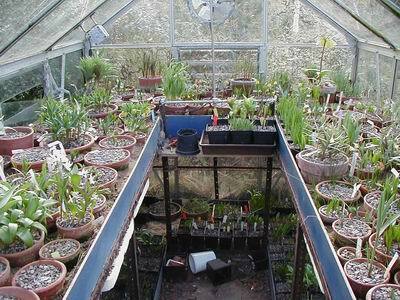 All the bulbs in the bulb house annex are raised from material we have got from Gothenburg Botanic Garden in Sweden both as seed or bulbils. 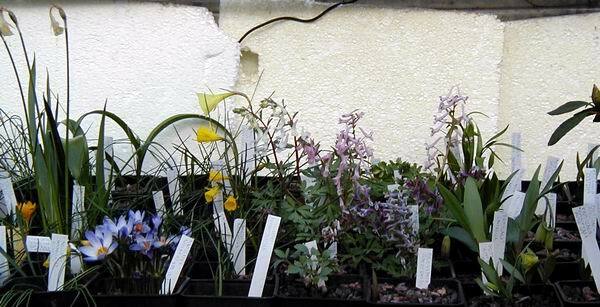 They have a wonderful collection of bulbs there and most are exceptionally good forms, as you might expect, Crocus, Narcissus, Frits and of course Corydalis. 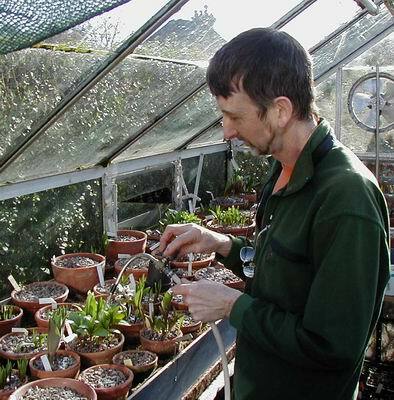 You will see that the annex bulbs are in square plastic pots, to make most efficient use of the space, and we have to apply a slightly different watering regime than we do to those that are plunged in clay pots. The plastic pots hold on to the moisture for longer so we do not water quite so often, you just have to watch the plants every day to decide when to apply water. 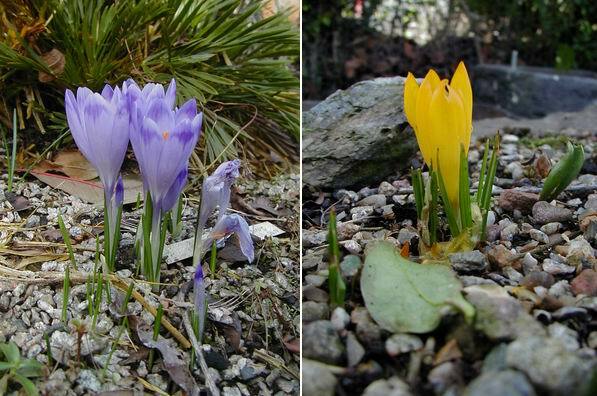 One thing you must watch out for when the weather turns cold and damp is the spent flowers of Crocus, in particular, seem to absorb the moisture from the air and then they can very quickly become infected with botrytis. 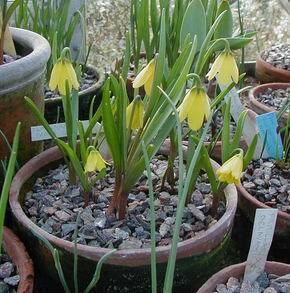 To prevent this and stop the bulbs becoming infected it is best to pluck off the flowers at this stage. We do not get this problem with the crocus in the garden where we have lots in flower just now, I will leave you with four this week. I think that the white one is a pure white form of vernus I am not sure what I should call it to be correct if any one knows let me know through the Bulb Log Feedback on the Forum.